A Vietnamese man has been arrested for attempting to smuggle an entire tiger skin and tiger bones into China, police said Thursday in the southeast Asian country where illegal wildlife trade flourishes. Vietnam is both a consumption hub and popular trading route for illegal animal products destined for other parts of Asia, namely China. 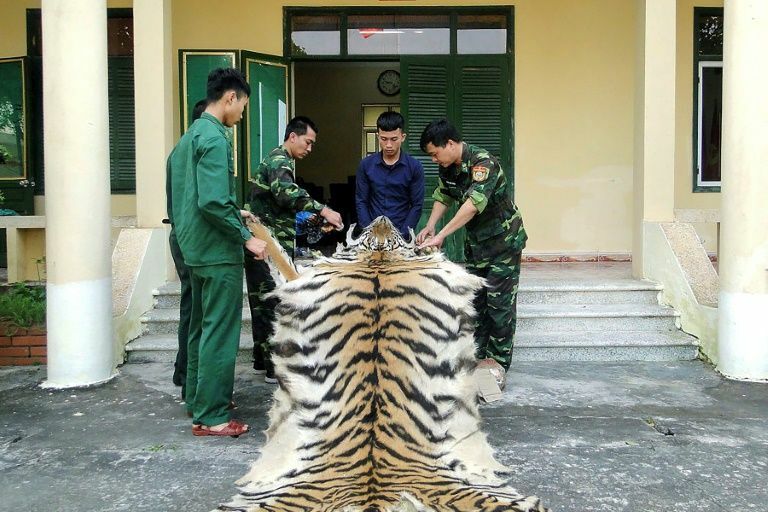 Border guards in Vietnam's northern Quang Ninh province arrested a man Wednesday carrying a full tiger hide and five bones, weighing a total of 5.4 kilograms (12 pounds). "The man attempted to bring the tiger items across the border," an official at a border station in Quang Ninh told AFP Thursday, requesting anonymity. A tiger skin can fetch up to $6,000 in Vietnam and as much as $10,000 in China, according to Vietnamese state media. The bones can sell for $1,000 per one hundred grams (3.5 ounces) in Vietnam. Tiger remains are highly prized in Vietnam, where their skin is used for decoration, their teeth and claws for jewellery, and bones, whiskers and paws for traditional medicine. Their bones are commonly boiled down and mixed with rice wine to make an elixir believed to treat arthritis and promote strength, which scientists have disputed. Along with ivory, rhino horn and pangolin scales, the illicit trade of tiger parts has shifted online in recent years, making sellers harder to catch despite government vows to crack down on the industry. Wild tiger populations have dropped globally by 97 percent over the past century and the animals are categorised as an endangered species, according the World Wildlife Fund (WWF). Tigers used to roam Vietnam's forests, but the last time the animal was photographed in the country in the wild was in 1997, and it is not known how many remain today. It is legal to raise tigers as pets in Vietnam with official permission, and there are an estimated 240 kept in homes and zoos across the country according to Education for Nature Vietnam (ENV) conservation group. This week's seizure is not the first haul of tiger parts in Vietnam. Five frozen tigers were discovered in a freezer in central Nghe An province in 2017, with their skins intact but internal organs removed. ENV recorded more than 630 cases of illegal marketing, trading and storing tiger parts in Vietnam last year.